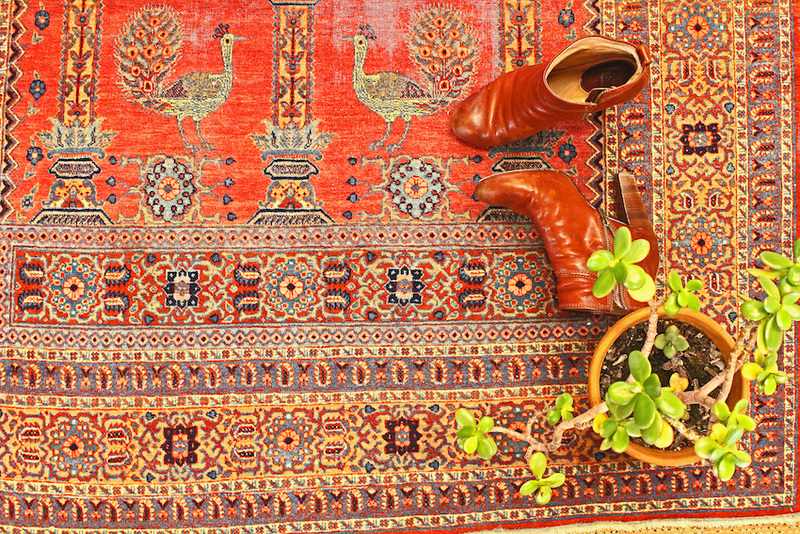 Is an antique or vintage rug right for you? 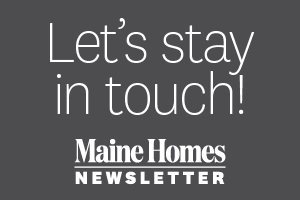 Bradford Ross of Bradford’s Rug Gallery in Portland takes the floor to help you decide. Twenty years ago, a refugee from Afghanistan helped Bradford Ross find his life’s work. The man imported rugs from his home country and sold them to the owners of the carpet store where Ross worked as a teenager. He was struck by the vivid colors and intricate hand weaving he saw in the floorcoverings and the stories the man told of sacrifices and gains he’d made pursuing new opportunities in America. “Seeing the greatness of what we have through his eyes changed how I approached my future,” says Ross of the refugee who became his mentor. In the ensuing years, Ross nurtured relationships with a diversity of rug suppliers and amassed a personal collection of their treasures. 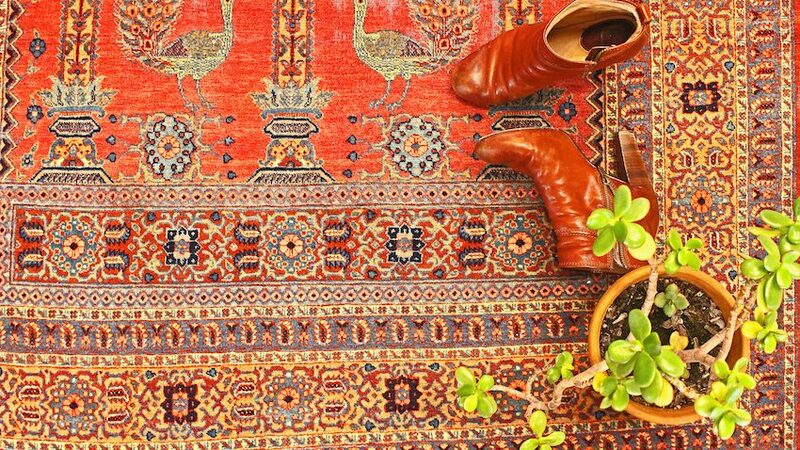 In 2006, he and his wife, Elizabeth, opened Bradford’s Rug Gallery in Portland, where they sell new floorcoverings from Middle Eastern, South Asian, and other regions, as well as vintage and antique selections — a particular passion for Ross. Here he explains how old rugs can breathe new life into contemporary homes. Q: What types of antique and vintage rugs do you seek out? 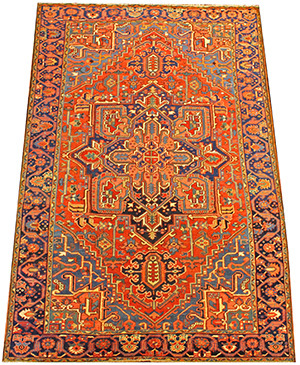 A: We have antique rugs from all over, but I especially like the bold colors and geometric patterns you find in rugs woven in the small villages of countries such as Afghanistan, Iran, and Turkey, as well as in the Caucasus region. They are more casual than rugs made in cities, which makes them easy to dress up or down, and you often see spontaneity in the weaving — someone might take a pattern his or her family has woven for generations and throw a llama in there or the motif might not be symmetrical on all sides. 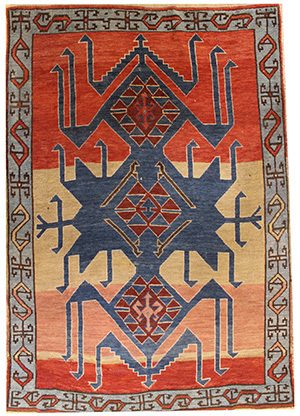 Primitive rugs also tend to be more vibrant than those from urban areas; for people living in deserts, bright, contrasting colors are the spice of life. Q: Why should people consider these and other antique/vintage carpets? A: There’s the patina — the slight mellowing of the colors and the shiny, silky look and feeling of the wool. Repurposing versus buying new is, of course, an important green concept, and mixing modern décor with older, unique pieces is very on trend. Antique and vintage rugs offer something that you’re not going to see in everyone else’s home. 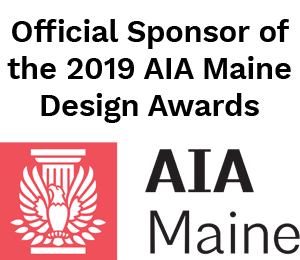 A lot of contemporary rugs also tend to be neutral and plain, which is not so conducive to living in Maine with mud and dogs and kids. Something with color, pattern, and even a little wear often makes more sense. Q: How do they hold up? A: This depends on the construction and condition the rug, but ultimately it’s a matter of where you intend to use it — a busy entryway versus seldom-used dining room. Generally speaking, older rugs are very durable. 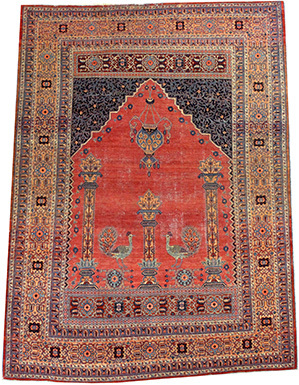 Antique carpets, and many vintage ones, are hand-knotted or hand-woven, techniques that result in products that can last 20 years or more in high-traffic areas. By comparison, a new tufted rug, which has backings held together with glue, may only last 10 years. Rugs made of wool, as opposed to synthetic fibers, are naturally fire-retardant and resistant to matting and spills. 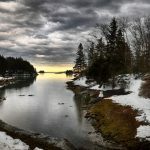 Those created prior to 1920 also contain natural dyes, which maintain their vibrancy better than the chemical dyes that were introduced afterward. A naturally dyed blue rug will lighten over time but it will always be blue, whereas a chemically dyed one will turn murky and gray. Q: What should buyers look for? A: Start with what you love and then consider functionality. A rug that shows wear or has undergone repairs obviously won’t last as long as one that is more pristine, but it may still meet your needs and can be an excellent value. A gently used antique rug, for example, might cost a quarter of what you’d pay for a comparable product that is brand new. Mint-condition antiques, not surprisingly, will cost significantly more. But these are investment pieces best preserved in a shoe-free, low-traffic area or by hanging on the wall. 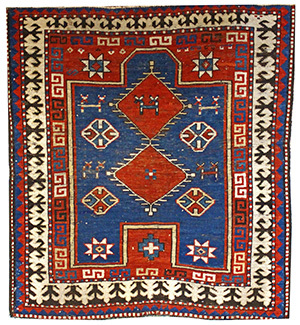 Ross’s favorite rug in his collection, this was woven by the Avars native ethnic group of Dagestan, a Russian republic in the North Caucasus region. The group specializes in flat weaves, making this piled example rare and sought after by collectors. 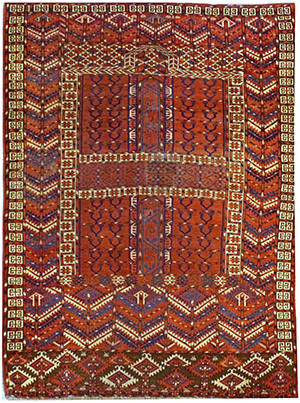 A prayer rug woven in the former Borchali province in the Southwest Caucasus region, this collectible piece exhibits exceptional color and spacing between motifs. 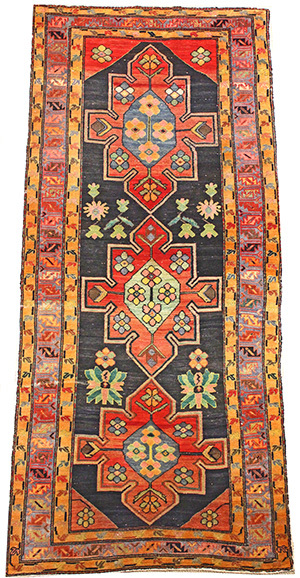 Ensi means yurt door hanging and this one was woven by the Tekke tribe of southern Turkmenistan. A nice decorative or beginner antique, the rug has been patched in two places. Created in Bidjar, a Kurdish town in northwestern Iran, Bidjar carpets are known as the “iron rugs of Iran” due to their densely packed piles. They are prized for their muted colors and bold patterns; older examples are courser and less floral. Sarouk carpets, like this one from the Ferahan region in central Iran, are characterized by dense weaves and tight floral patterns; they were primarily produced for wealthy clients. 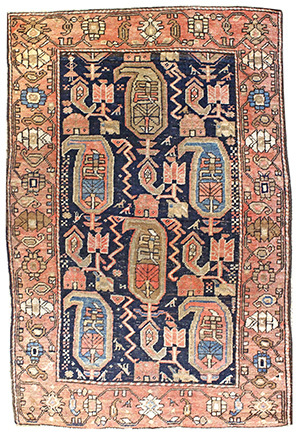 A trio of medallions enlivens this hand-knotted rug with uniform wear from the Caucus region in central Asia. Crafted in master weaver Haji Jalili’s workshop in Tabriz, Iran, Hajis are the designer jeans of antique rugs. They are distinguished by finely detailed cypress trees, weeping willows, deer, gazelle, and peacocks, such as those seen in this prayer rug. 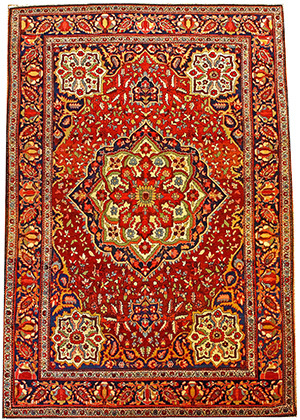 A central medallion dominates Iranian Heriz carpets, but no two are exactly alike. Villagers create the designs as they go, guided by simple drawings and local traditions. 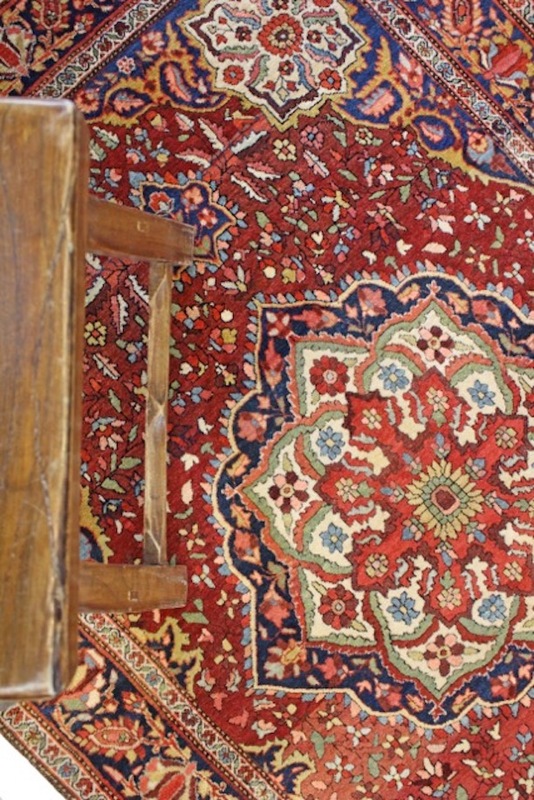 After Bidjars, Heriz are among the toughest Persian carpets.